In 2015 there were 25,841 DUI crashes, 76 percent of them involving a male driver who was under the Influence. Of these crashes, 1.167 were fatal. 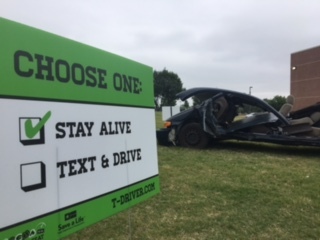 Unfortunately, these numbers are not nationwide statistics, they only represent DUI crashes in the state of Texas. With prom coming up, administrators are working hard to teach students how to save a life and yours. Between the years 2010 and 2015, 13 percent of teenage drivers were not wearing a seatbelt at the time of the crash. It’s important to understand that a seatbelt is the first life saving device in your vehicle. In 2014, 48 percent of accidents were fatal because of someone not wearing a seatbelt. Friends and phones are big distractions while driving. While your friends are probably not distracting you on purpose, it’s okay to tell them to quiet down. It’s not just your safety to worry about, it’s the safety of your passengers. All it takes is 1-2 minutes of drinking for it to become fatal. Alcohol consumed in excess is harmful not just to your decision making, but also your organs and breathing. If the liver is not given time to filter out the alcohol, you can get alcohol poisoning which can lead to death. Five thousand people under the age of 21 die every year because of alcohol poisoning. Falling into peer pressure, teens don’t call their parents or 911 when they know the situation is dangerous. They are afraid of the trouble they would get in, and not afraid of the guilt they would feel the rest of their lives if something horrible happened. If you notice something amiss, don’t be afraid and you may be able to save a life. Lives have been devastated by the death of a loved one because of a “harmless” night of fun. Teens love their cars, but the love your family and friends have for you is more important than any scrap of metal.